SUITABLE FOR FOOD GRADE APPLICATIONS, SEE TB FOR POST-CURE REQUIREMENTS Smooth-On Platinum Silicones (platinum curative) cure at room temperature with negligible shrinkage. These silicones exhibit good chemical, abrasion and heat resistance. Materials such as plasters, concrete, wax, low-melt metal alloys or resins (urethane, epoxy or polyester) can then be cast into these silicone rubbers without a release agent. Smooth-Sil Platinum Silicones are used for rapid prototyping, wax casting (foundries and candle makers), architectural restoration and for casting concrete. READ the MSDS before using. 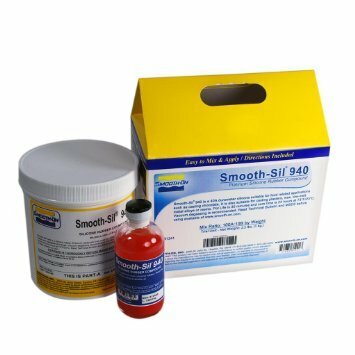 See technical bulletin for usage instructions available at www.smooth-on.com. MIX RATIO: 100:10 by weight; POT LIFE: 30 mins; DEMOLD TIME: 24 hours; SHORE A: 40; COLOR: PinkSuitable for Food Grade applications (See Technical Bulletin) – Great for making baking molds and trays, ice trays, casting butter, chocolate, fondant and other applications used to produce foods. Also can be used for general mold making. Materials such as plasters, concrete, wax, low-melt metal alloys or resins (urethane, epoxy or polyester) can be poured into it.